A few years back there was national anger and outrage after the South Fulton, Tennessee fire department stood by and watched a family’s house burn to the ground because it had not paid a $75 fee for fire protection. Unfortunately, the anger was aimed at the fire fighters when it was probably not something they wanted to do. The real culprits might well be found sitting quietly in their ivory towers within local government offices. As a former volunteer fire fighter, I know exactly what that chief meant. The crew I proudly served with went out of its way, some of our members risking life and limb to put out fires and rescue people and even pets caught in burning buildings. Turning away from a burning building is not something any real fire fighter would intentionally do. During my fire fighting days in South Haven, Michigan, however, I also was once on a fire truck that turned away from a township fire and we were forced to watch buildings burn. It made us all sick. And the situation we found ourselves in was political. The township where that farm was located was just over the township line. And the township had declined that spring to pay for fire protection. As a working news bureau reporter I was well aware of the rift between the City of South Haven and Casco Township, in nearby Allegan County, over a decision to increase the yearly charge for township fire protection. The Casco Township board balked that spring and rather than dip into the township’s limited coffers to pay South Haven, it chose instead to contract with the City of Allegan for its fire protection at a less costly rate. The farm where this fire occurred was within a stone’s throw of the South Haven City limits. The city limits stopped at the Allegan County and Casco Township line. The City of Allegan is the Allegan County seat, located some 40 or 50 miles away. It doesn’t take a genius to figure out that the township board’s decision that spring put township property owners living close to South Haven in jeopardy. The whole issue would probably have been ironed out, as political issues like that usually are, and nobody would have been the wiser had there not been a fire during those critical weeks when all of the bickering was going on. But it was spring, the snows had melted, and there was dry grass being fanned by hefty breezes blowing right off the open waters of Lake Michigan. We were always busy that time of the year because grass and brush fires were breaking out everywhere. That is what this fire started out to be. It was a grass fire, probably caused by sparks from a carelessly unattended trash burner on that Casco Township farm. When the call came in all that we knew is that the fire was at the north end of South Haven. I happened to be waiting at the fire hall with other volunteer and regular fire fighters that day. It was a breezy spring day and we were expecting just such a fire to happen. When the call came in we jumped in our bunkers and were climbing into the pumper-tanker, especially designed for rural blazes because it carried enough water to knock down most fires. The guys that drove those trucks were regular, full-time fire fighters employed by the city. Our crews were comprised of both regular and volunteers. As we were climbing into that truck I remember our chief warning us that we had to stop at the Casco Township line. We worried that “the north end of South Haven” might be on the wrong side of the line. As we roared down old Blue Star Memorial Highway and began seeing the smoke, we knew the worst was happening. The fire was just over the line. We stopped the fire truck, within a few hundred feet from the fire. Every man in that truck, including the driver, wanted to defy that order and continue on to snuff out that grass fire. 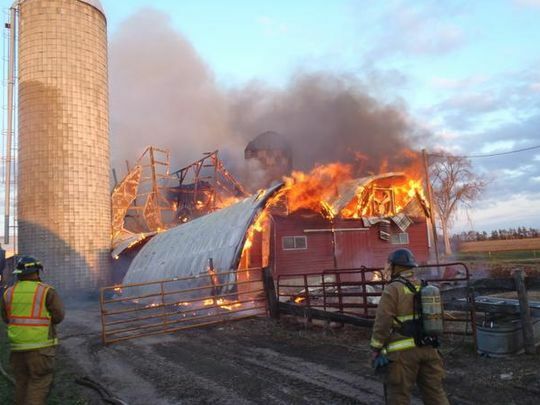 We saw that the flames were getting dangerously close to one of the out-buildings on the farm, and once that building burned, the barn located a few feet away was going to burn. After that, because of the way the wind was blowing, it was possible that the flames would spread to the house. We would have stopped that disaster within minutes if we could have done our job. We wanted to do our job. It was our nature to want to help. It was what we were trained to do. It was our passion as fire fighters to fight fire. We did not care who paid for our services or if we even got paid. If it had been my decision that day I would have defied the chief’s order and gone ahead and put out the grass fire. But the driver, a regular city employee, knew that his job would probably be on the chopping block if he defied the chief. And the chief, who had been fighting fires all of his life, was probably agonizing over that order as much as we were. If he had defied the order that had been sent down from the city manager’s office, which came from the city council, his own job would have been on the line. That was the political drama occurring behind the scenes. So we turned the fire truck around the drove back to the fire hall. That we had been called first to the fire and then turned around caused a delay before the call was passed to the Allegan Fire Department. Precious time had been wasted. It was another 40 minutes or more before Allegan fire fighters arrived. By then the barn was ablaze. I think they saved the house. That incident served its political purpose. Casco Township paid its dues the next week. That farmer had been the unfortunate pawn in a dangerous political game of chess occurring between government boards that spring. This is why my heart went out to those fire fighters in South Fulton. They may have been caught in a similar political trap and forced to do what they did. I could almost sense their agony when I looked at a photo of the men sitting in that fire truck with the house ablaze in the background. It wasn’t arrogance we saw on those faces. It was sadness. The flawed system used in that rural area, demanding individual yearly fire insurance payments from homeowners, was ripe for just such a disaster. According to news reports, folks in that area of Tennessee are Libertarians at heart, which means they are opposed to taxes and prefer few government services. While I understand and sometimes agree with many of the Libertarian views, I also believe the struggle over political ideologies should never interfere with some of the basic needs we all share for human services like fire, police and health.